ProModeler servos are supplied with anti-vibration mounts designed to isolate and protect the delicate internal components. Consisting of custom-molded rubber grommets, along with brass eyelets plus servo mounting screws, these components must be properly assembled to function optimally. The design intent is for the rubber grommets to snap into the holes within the servo's mounting tabs. Then for the brass eyelet to push into the rubber from the bottom. Finally, for the entire assembly to be captured securely by screws, which slip in from the top and thread into hardwood rails (or a plywood/carbon plate or frame). Arguably the most important component of the isolation mount is the rubber grommet. These are custom molded to suit the frame (i.e. the physical size of the servo - mini or standard size). The rubber also accounts for the expected loads. 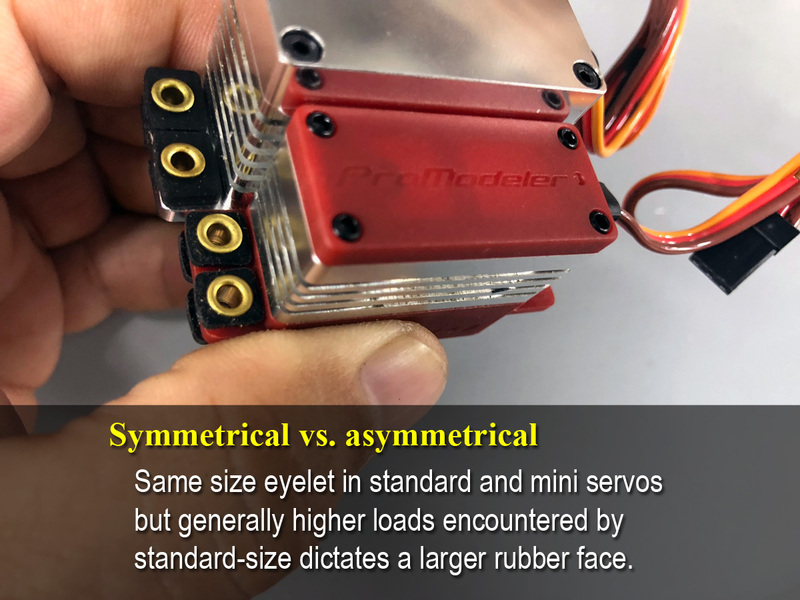 Since standard-size servos are larger and output greater torque, they will reasonably see larger loads and thus, the rubber is larger. Note, while mini-size rubber grommets are symmetrical (meaning there is no upside-down), this isn't the case with standard size grommets, which are asymmetrical (meaning one face is slightly larger than the other). 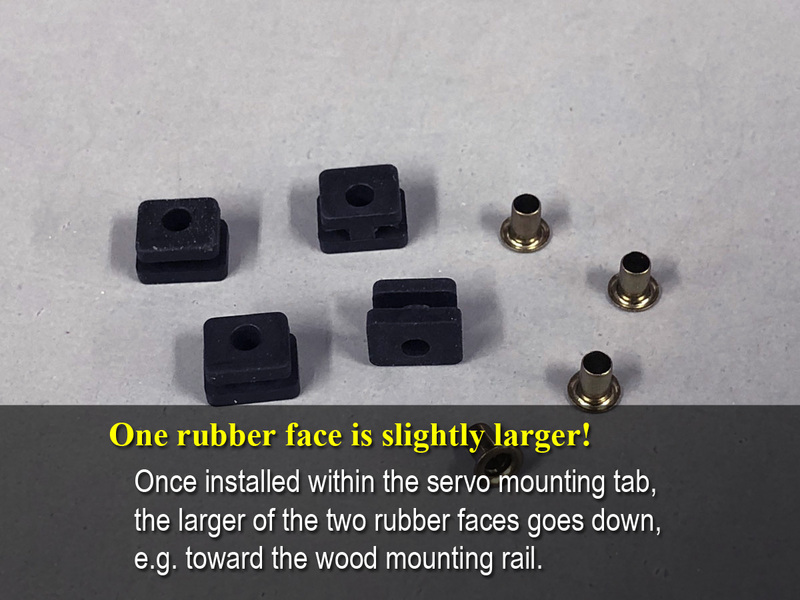 The reason standard-size servo grommets have a larger face on one side is because once both grommets are installed within the mounting tab, the bottom surface area matches the bottom of the mounting tab. Thus, the rubber fully supports the servo on the typical hardwood rail (or plywood) universally incorporated into model aircraft designs. Next, it's important to fit the brass eyelets in from the bottom. The idea is the broad face of the brass sits on the wood mounting rail and thus, won't dig in like it would when installed from above. 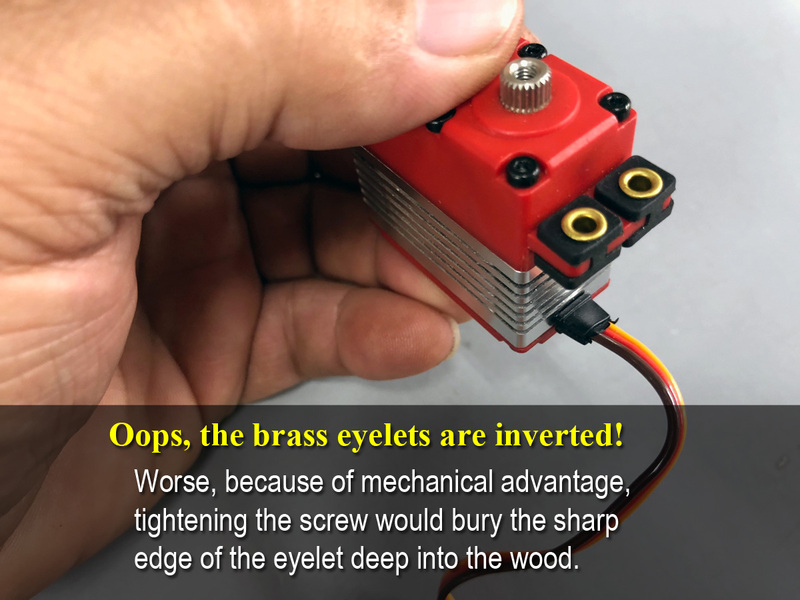 Do that and the sharp edge of the brass eyelet is driven into the wood as the mechanical advantage of the screw over-compresses the rubber - oops! 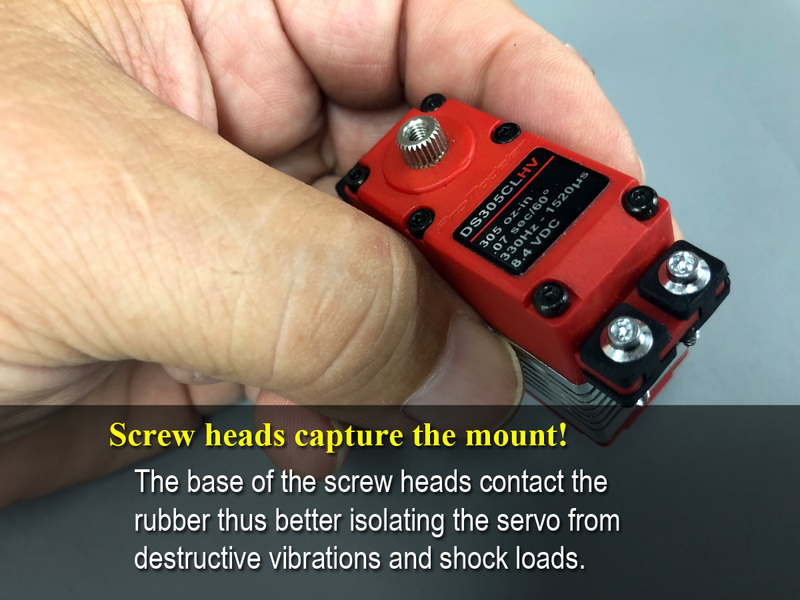 Finally, once you insert the mounting screws into the mounting holes, as you tighten them the screw face (the underside of the head) lightly comes into contact with the rubber. Tighten a smidgen further and stop before the screw head bottoms against the brass eyelet (and the rubber begins to twist) then presto, the servo is properly secured to the model. The end result is the rubber isolates the delicate electronics from the vibrations of an out of balance propeller, the power impulses of an engine, the effects of flutter, or the harmonics of various vibrations. 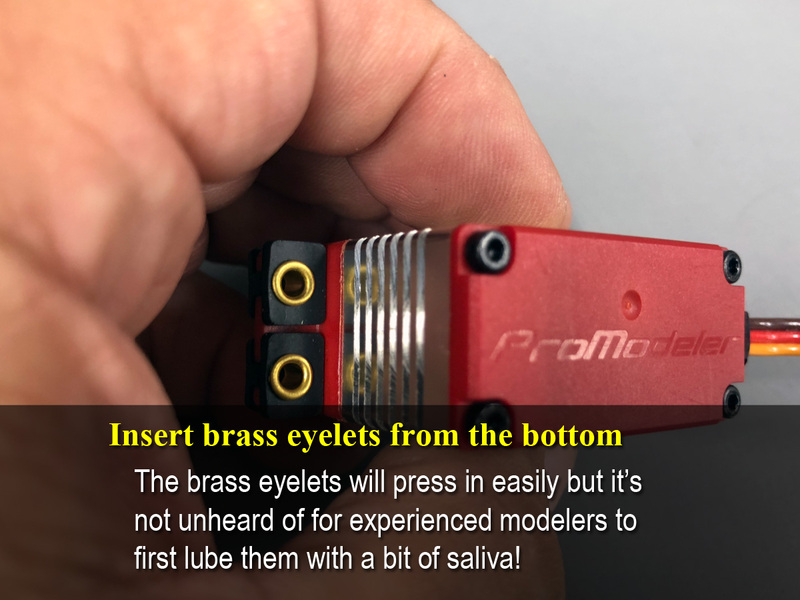 The most common mistake we see is due to a modeler installing the brass eyelets from the top instead of from the bottom because then, as the screw contacts the eyelet base, it drives the sharp edge of the eyelets into the mounting rail. And it goes in really easily too because of the mechanical advantage a screw thread provides. 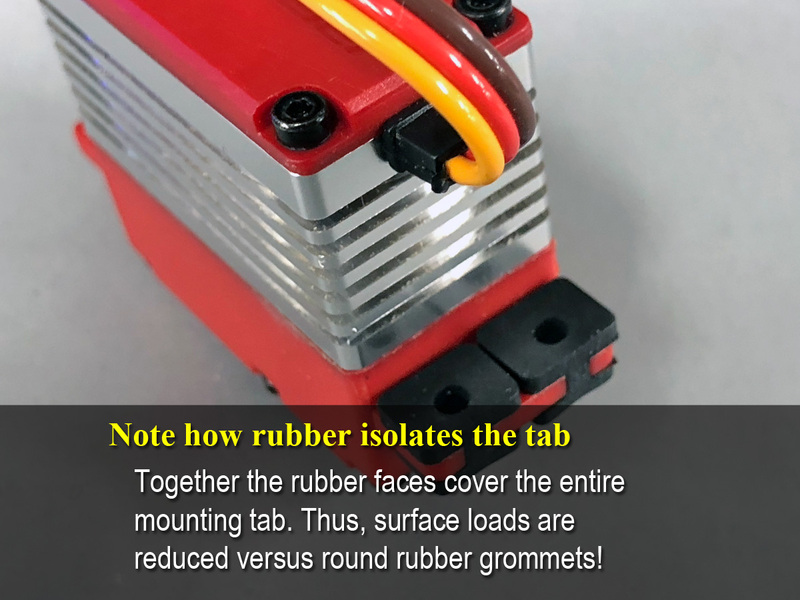 In summary, rubber isolation mounts are an elegant solution for protecting the servos from damaging vibration and shock loads. While they're easy to assemble, the job must be done right or they won't function as intended. The standard and the mini-size servo both use isolation mounts, but the standard size uses an asymmetrical-grommet where the face in contact with the hardwood rail or plywood mount is larger expressly to handle the higher anticipated loads. Pro Tip: Ever removed a servo and realized the rubber grommet had gone hard? This happens because of the ozone in the atmosphere and is why the rubber gaskets securing the windshield of classic cars begin to crack. Ozone damage is also why tires have limited lifespans based on time versus wear. And the same thing happens with the rubber grommets of servo isolation mounts, they can get hard and once that happens they're directly transmitting vibration and shock directly to the delicate bits of the servo, which is bad! Want to know what separates the typical club pilots from the real professionals? Basically, the pros engage in preventive maintenance. Thus, as a matter of routine, they inspect wear components. For example, once the season is over (or for club pilots, once it's too cold to fly) pros go through their model with a fine tooth comb. They inspect everything to include using a VOM to check for increased resistance through the radio switches (in fact, most pros I know just replace on-off switches yearly figuring it's cheap insurance). They also replace the fuel tubing (obviously, only models equipped with nitro and gasoline engines). Compared to club pilots, pros are fanatical about their equipment and go so far as to verify the condition of wheel and axles for wear, spinner back plates for cracks, track down any hint of excess play in hinges and control linkages, cycle batteries (or replace flight packs altogether), etc. Basically, they strip a model down - to the bare bones so to speak - and inspect 'everything' before the next flying season. As for us, we know when we're dealing with pros because they order a few packs of servo isolation mount grommets. Is there a lesson hiding in plain sight for the rest of us?